INGREDIENTS: Blueberry-Pomegranate Orchard Bar fruit [fruit juice from concentrate (organic apple, blueberry, pomegranate), blueberries, pomegranate powder, organic apple flake], organic evaporated cane syrup, organic tapioca syrup, almonds seeds (sunflower, flax), soy protein nuggets (soy protein isolate, tapioca starch, salt), fruit pectin, citric acid, natural flavors, sodium citrate, ascorbic acid, Vitamin E (to preserve freshness). INGREDIENTS: Pineapple-Coconut Orchard Bar fruit [fruit juice from concentrate (organic apple, pineapple), pineapple, coconut, organic apple flake], organic evaporated cane syrup, organic tapioca syrup, nutmeats (macadamias, cashews, Brazil nuts) seeds (sunflower, flax), soy protein nuggets (soy protein isolate, tapioca starch, salt), fruit pectin, citric acid, natural flavors, sodium citrate, ascorbic acid, Vitamin E (to preserve freshness). ALLERGEN INFORMATION: Contains macadamias, cashews & Brazil nuts and soy. May contain traces of peanuts and tree nuts not listed in the ingredients. INGREDIENTS: Banana-Mango Orchard Bar fruit [fruit juice from concentrate (organic apple), mango, banana, organic apple flake], organic evaporated cane syrup, organic tapioca syrup, nutmeats (macadamias, cashews, Brazil nuts) seeds (sunflower, flax), soy protein nuggets (soy protein isolate, tapioca starch, salt), fruit pectin, citric acid, natural flavors, sodium citrate, ascorbic acid, Vitamin E (to preserve freshness). INGREDIENTS: Cherry-Almond Orchard Bar fruit [fruit juice from concentrate (organic apple, cherry), cherries, organic apple flake], organic evaporated cane syrup, organic tapioca syrup, almonds seeds (sunflower, flax), soy protein nuggets (soy protein isolate, tapioca starch, salt), fruit pectin, citric acid, natural flavors, sodium citrate, ascorbic acid, Vitamin E (to preserve freshness). 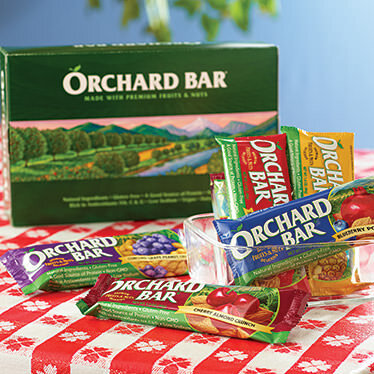 There is nothing out there that can compare these tasty bars! Even on Weight Watchers these bars are great, satisfying and just packed with flavor for breakfast!